The management of critically ill or injured children has become increasingly specialised; nevertheless, the first point of contact for many sick children remains their nearest hospital. Here, the initial management will usually involve emergency department doctors, anaesthetists and paediatricians. 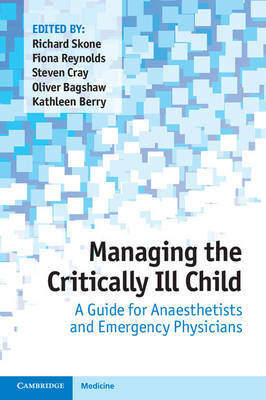 Managing the Critically Ill Child is written by anaesthetists and emergency department physicians who currently have a significant paediatric practice. It provides a straightforward guide for non-paediatricians encountering acutely unwell or injured children. This book helps readers apply their knowledge from adult practice to children, and avoid pitfalls where the approaches in paediatrics differ. Written in a practical, concise format, Managing the Critically Ill Child guides physicians beyond the initial emergency algorithms and is essential reading for physicians and trainees in emergency medicine, anaesthesia and intensive care who may be asked to look after a child.